TESTIMONIAL: “I was told that from years of wrestling, I had landed myself with two compressed disks and a small fracture in the spine. I found that through Marina and her cupping the muscles around my injuries freed up and gave me the ability to compete at a national level again. I am still reaping the benefits of her treatment! And would recommend it to any athletes and active people.“ Andrew Orr, NZ amateur wrestling gold medalist. TESTIMONIAL: "I had the absolute pleasure of having a session today with Marina Locke. Her vast knowledge leads to the various positions and techniques that she used on me. I felt stretches and pressure relief that my body has not experienced in previous massages. Marina was very good at relieving pressures I've been experiencing from baby weight. I left the session feeling relaxed and cleansed. I would highly recommend Marina to anyone looking for a great prenatal massage." Kendra Z.
I honour your wellbeing by passing along package rates discounts for frequent treatments ("regulars"). Taking the treatment session to the next level, this treatment incorporates multiple therapies to enhance total wellbeing of body, mind, emotions and spirit. A full body structural integration massage, pre-treatment assessment, post treatment breathing and postural enhancing techniques. Optional techniques include Yoga therapy, spinal balancing, aroma (using essential oils), colour and sound techniques integrated into the session at your request. Some preparation time is needed for these options so best to let me know well ahead of the treatment. Treatments are 60-90 minutes, $75-$130. According to the most recent recommendations from the American College of Physicians, massage therapy is most effective as a pain treatment intervention when combined with patient education and or exercise. This same paper also identified yoga as an effective movement therapy/exercise intervention. Pregnancy Massage is a specially designed full body treatment that targets the areas of common complaints and can also educate the recipient on positive pregnancy and birthing experiences. Postnatal massage can help the woman catch up on some much needed sleep and help her milk let down reflex, which is especially helpful if her supply is decreasing. Pelvic floor issues may also be addressed. First visit is $85 (discount if you are a yoga student), subsequent visits are $75. Therapeutic Deep Tissue massage is an integrated, tissue thorough massage that focuses on alleviating areas of stress, pain or injury. 30-60 minutes, $50 - $85. Sports Massage treatment targets the areas of the body that are used in your sport to help you perform better (pre-event) or recover from injury or stress (post event). For best results post event have treatment 2 hour - 2 days after event. Pre-event can be anytime, up to 45 minutes before the event. 30-60 minutes, $50 - $85. Relaxation Integration Massage is a sleep enhancing treatment applied gently and finishes with Craniosacral Therapy. 30-45 minutes, $60-$85. 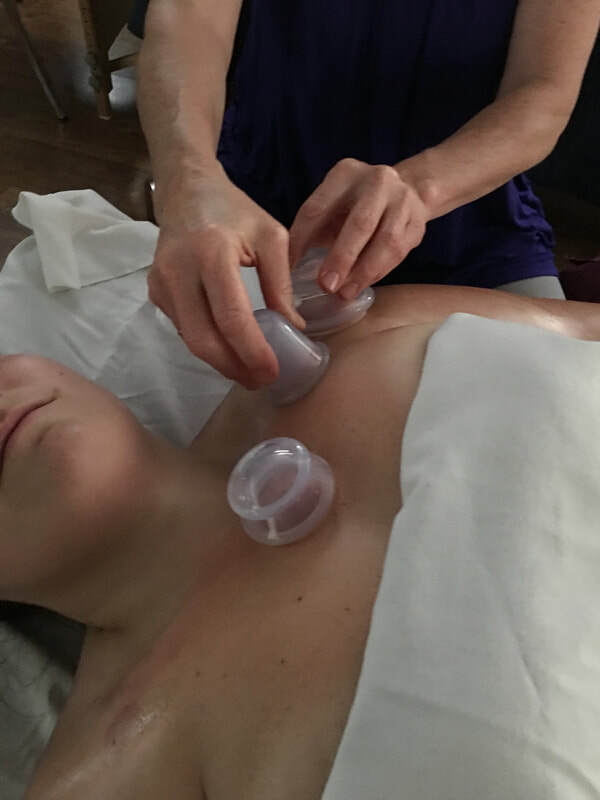 Dynamic Cupping treatments now available. 10 - 60 minute sessions targeting specific areas of concern. This is a newly emerging technique based on an ancient therapy. I find excellent results for most non-specific chronic back pain, old injuries that are still niggling, scar tissue and trigger points. Dynamic Stone Therapy treatments now available. 10 - 60 minute sessions targeting specific areas of concern. Another newly emerging technique based on an ancient therapy. Also excellent for most non-specific chronic back pain, old injuries that are still niggling, scar tissue, and chronic tension. Works well with dynamic cupping. Learn the art of massage with supervised session. 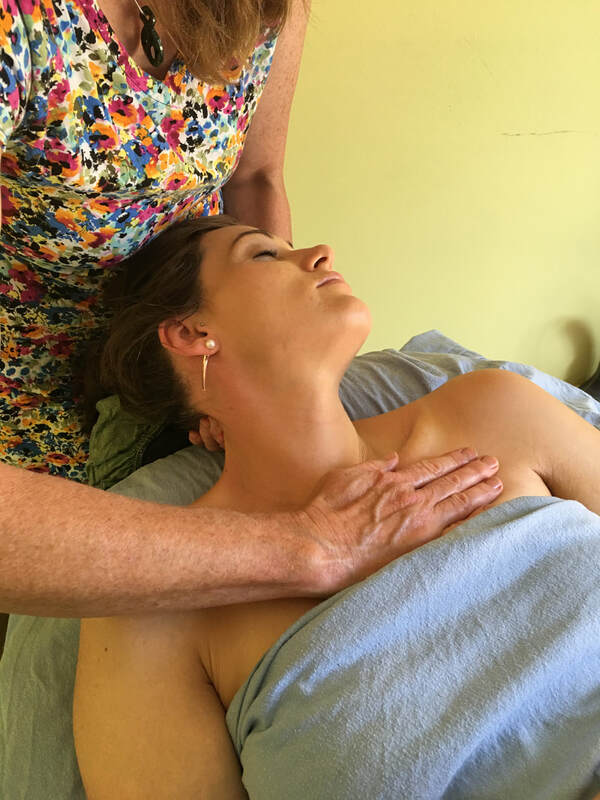 Whether you want clarity for a practice you already have or to learn a new skill, Marina will share her expert experience and skill in a private, clinical setting. Learn the art of massage for birth support or for relaxation. TESTIMONIAL (Postnatal): “I recently had a terrible milk supply, so bad that my 10hr night sleeper stopped sleeping through…I wasn’t sure what to do, nothing seemed to help increase it, more water, fenugreek, pumping, etc. A friend recommended that I get in touch with Marina, she has worked wonders, I’ve gone from not even being able to pump to it literally dripping come 8pm at night, this does not happen in my world! I’m absolutely stoked (as is wee Bronte) that she could help, formula isn’t an option at this point for us. I was at a loss as to what to do but all she did was a quick massage on my back, I swear those hands are magic! Anyway the moral of my story is there is always an alternative. “ Aimee N.
TESTIMONIAL: "I can't recommend Marina highly enough. I had many massage therapists over the years. Marina is exceptional, she doesn't just push muscles around she treats you holistically and really listens. Her passion is underscored by solid professional training shines through. When I met Marina I was on an all time low, 6 weeks later I am revitalised, and have has a decade old problem resolved." FIONA W. P.